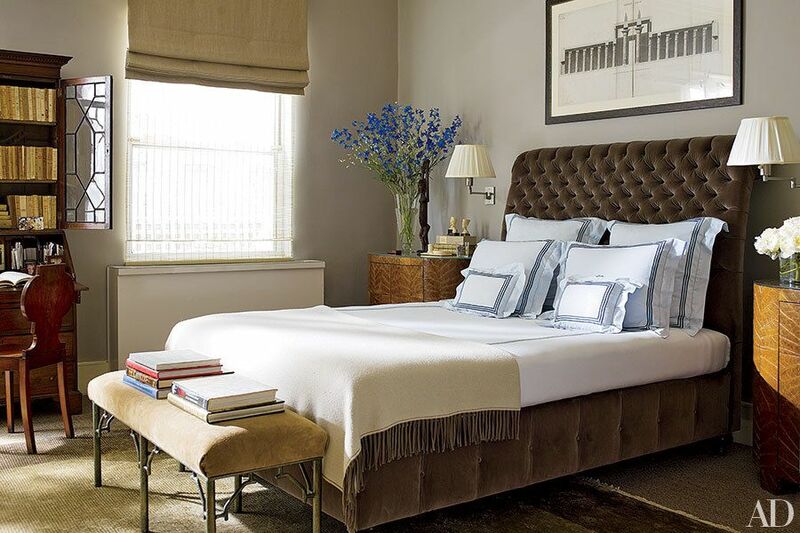 A bedroom should be a relaxing retreat, so it’s no wonder that neutrals are often the go-to palette. 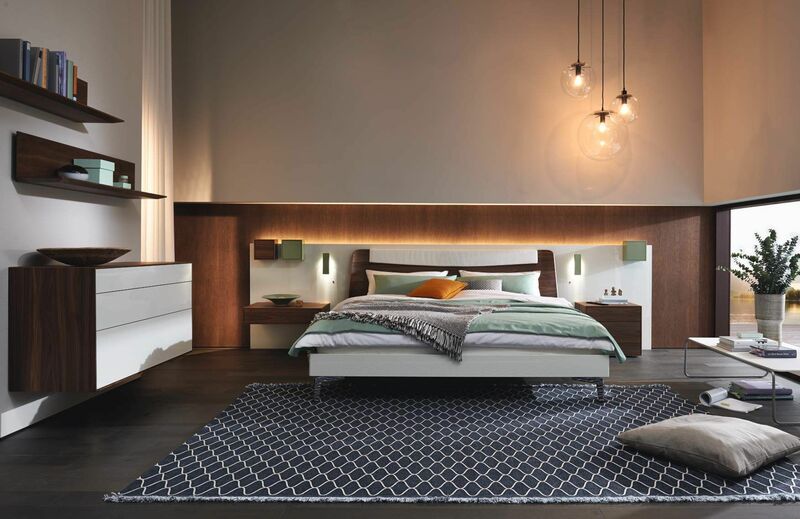 While white and cream have been favorites for years, more and more designers are turning to gray to give their clients’ bedrooms a polished and Zen feel. 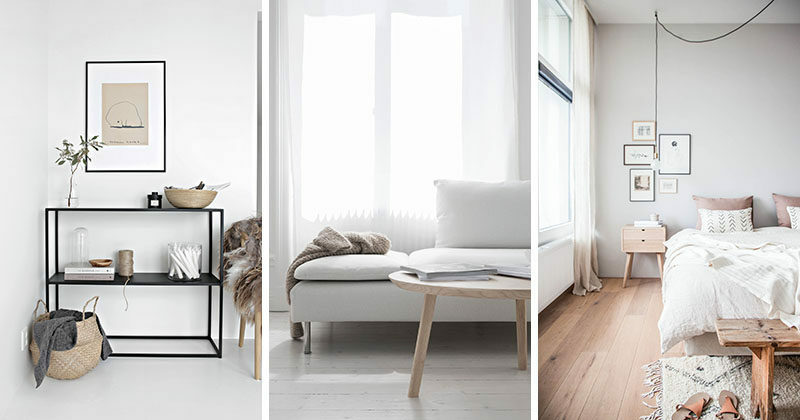 The versatile shade pairs with every style of decor, from traditional to ultramodern, and provides a sophisticated background for art, furniture, and accessories. From an ornate space in a Chicago penthouse to a cheery children’s room in London, these bedrooms from the AD archives showcase easy ways to create a tranquil escape with just a few coats of paint. Peruse these dreamy retreats that prove gray is far from dreary or dull. Wrapped with a Gracie wallpaper and hung with Japanese screens from Galerie Anne-Marie Monin, the master bedroom of this Chicago duplex penthouse was renovated by designer Michael S. Smith in collaboration with Marvin Herman & Assoc. Architects. A 1963 Le Corbusier print and a Swedish Biedermeier chair covered in a needlepoint fabric brighten the master bedroom in architect Steven Harris and interior designer Lucien Rees Roberts’s New York loft. A circa-1865 architectural drawing overlooks the master bedroom in this Manhattan duplex; the bedding is by Schweitzer Linen, and the bench and bedside commodes are by Garrison Rousseau. 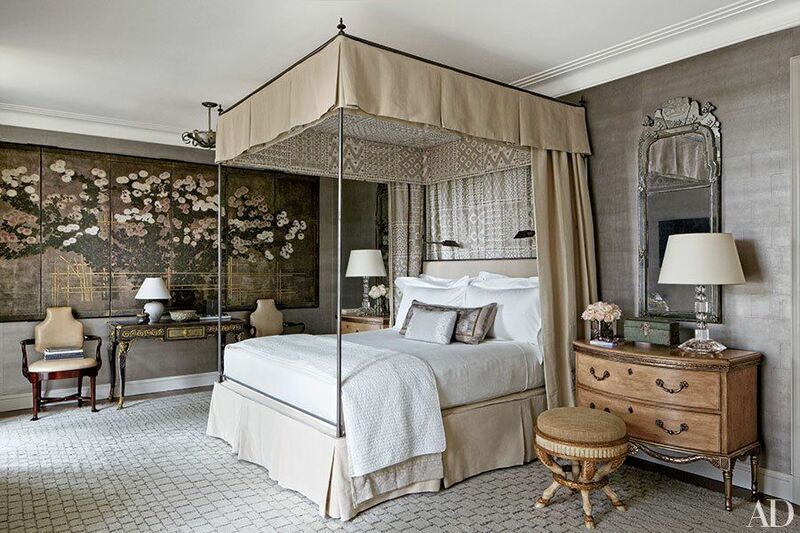 In the master suite of a Manhattan penthouse by architect Lee F. Mindel, the bed is dressed with a skirt of Dedar fabric, Matouk linens, and a Rosemary Hallgarten throw. The starburst mirror is vintage Line Vautrin, the nightstands are topped by vintage Lisa Johansson-Pape lamps, and the walls are painted in Benjamin Moore’s Sterling gray. In the master bedroom of this Philadelphia-area home, matching custom-made slipper chairs, covered in a Claremont fabric, flank an all-white Robert Ryman canvas over the fireplace. Jayne Design Studio decorated the residence. 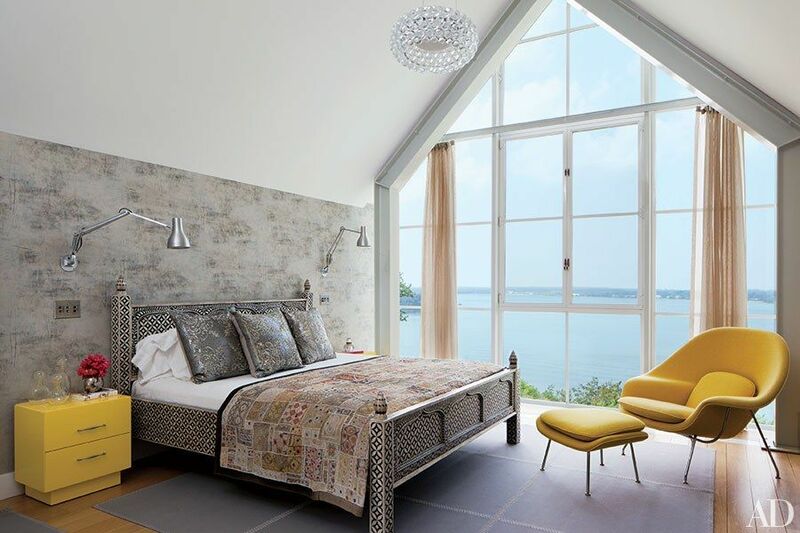 The master bedroom of this Shelter Island, New York, retreat by Michael Haverland and decorator Philip Galanes is lined with a Carolyn Ray wallpaper; the Saarinen chair and ottoman are by KnollStudio. The walls of this Florida master bedroom decorated by Furze Bard + Assoc. are upholstered in an Élitis linen. This 1950s Los Angeles home’s master bedroom features a stainless-steel four-poster with an upholstered headboard that was custom made by Madeline Stuart. A chandelier by Williams-Sonoma Home overlooks the master bedroom in this Beaux Arts building in Kansas City, Missouri. A Lynn Geesaman photograph is displayed in the master bedroom; the nightstand is by BDDW, and the rug is by Edward Fields. Manhattan-based Kathleen Walsh Interiors decorated the home, which is located on a Martha’s Vineyard organic farm. At a midcentury house outside Paris renovated by architect Charles Zana, pieces by Richard Prince (left) and Lee Ufan (center) are among the master bedroom’s artworks; the headboard, nightstands, and TV cabinet are all by Atelier Pierre Bonnefille, and the carpet is by Tai Ping. This Manhattan master bedroom, renovated and decorated by Carlos Aparicio of Aparicio + Assoc., includes Cindi Johnson prints from BAC that flank the custom-made bed. The walls in this master bedroom on New York’s Upper East Side were given an antiqued metallic finish by artist Patricia Arnillas; the print is by Henri Matisse. Design firm Stephen Sills Assoc. 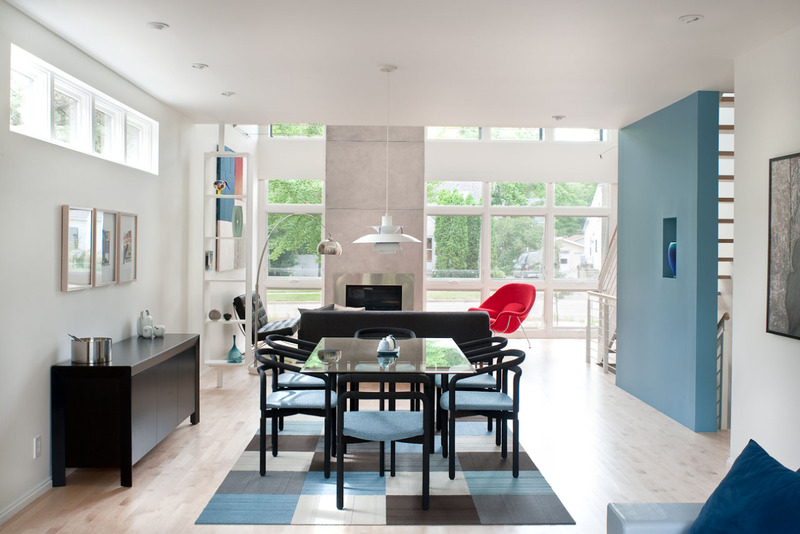 worked with John B. Murray Architect to renovate the apartment. A New York apartment renovated by architect Richard Perry and decorated by Shawn Henderson Interior Design includes a bedroom with a custom-made headboard upholstered in a Jim Thompson fabric that spans twin beds, while the wall behind it is sheathed in a Maharam fabric. In the master bedroom of a New York apartment by architect Lee F. Mindel of Shelton, Mindel & Assoc., two circa-1925 Pierre Chareau sconces are stacked vertically beside #12, a photograph by James Welling. At the London home of Nadja Swarovski, a Guy Davis photograph of a lion is displayed over the Union Jack–covered bed in her son Rigby’s room; the walls are painted in Farrow & Ball’s Ammonite. In the master suite of Ellen DeGeneres and Portia de Rossi’s Beverly Hills home, the custom-made bed is upholstered in a Great Plains fabric and topped with an antique French textile from Lief; the Torpedo floor lamp is by Jane Hallworth, the cabinet is a Gustavian antique, and the walls are upholstered in a gray flannel by Holland & Sherry. In the master suite of jewelry designer Ippolita Rostagno’s Brooklyn brownstone, Mark Mennin sculptures hang above a Patricia Urquiola for B&B Italia bed dressed in RH linens and an Yves Delorme coverlet; the curtains are also by RH, the Murano-glass chandelier and rug are from ABC Carpet & Home, and the walls were painted in a decorative finish by Surface & Architecture Workshop. 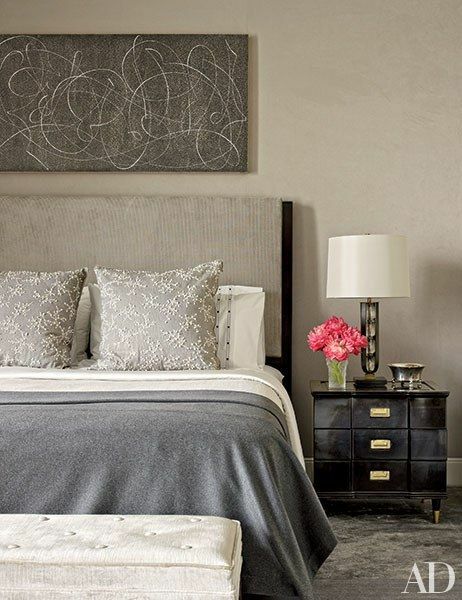 A Knoll Ultrasuede sheathes this master bedroom, where an Elliott Puckette painting is displayed above the headboard. Architect Peter Pennoyer and designer Victoria Hagan remade the Manhattan residence. 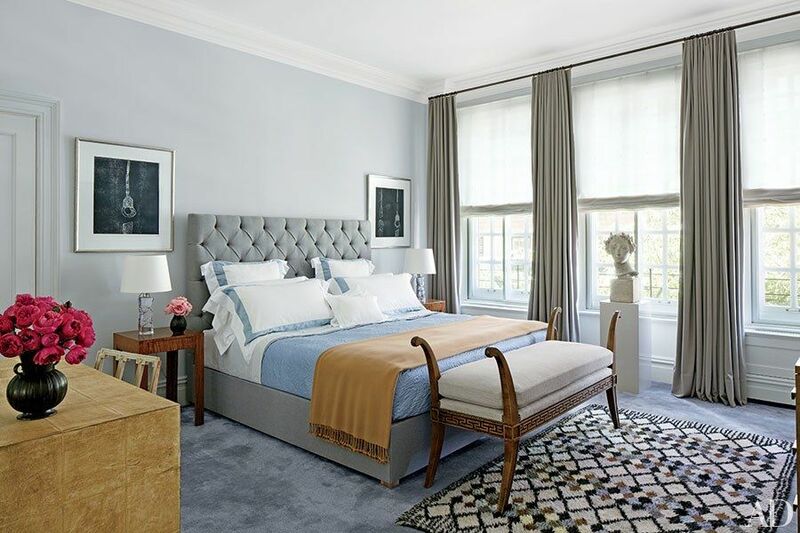 Painted in a Benjamin Moore gray, the master bedroom of this 1840s Manhattan townhouse was decorated by Christine Markatos Design. In a child’s bedroom of a Chicago-area residence designed by Peter Gluck and Partners, the Caro Alto area rug is by Casalis, and the tufted floor lounge is from PBteen.